This weekend I attended the 31st. Boston International Antiquarian Book Fair. I heard about this event after a visit to the John Carter Brown Library and decided to check it out. I saw a number of fascinating book, not all as old as I expected. 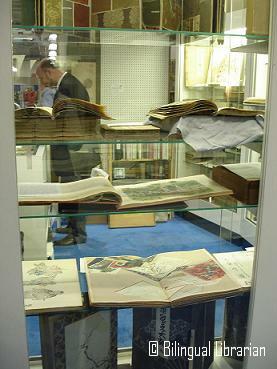 Some of the exhibitors had material that dated back hundreds and hundreds of years, as well as other book from the 20th century. Newer books were usually first editions and they were usually signed. Among these first editions I saw books by Garcia Marquez, Steven King, and John Steinbeck, among others. 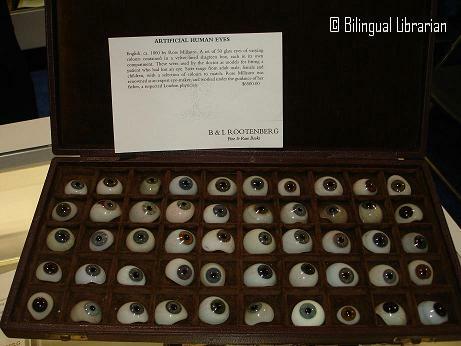 Some of the vendors had old maps, prints (including an original Chagall), poster, and I even saw an entire case of glass eyes that was for sale. 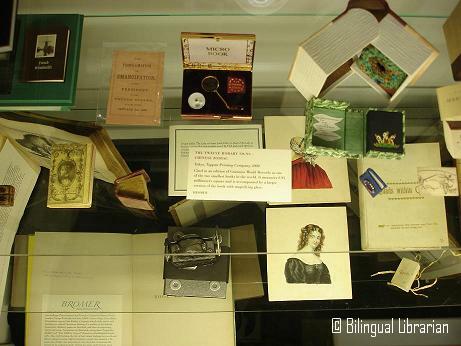 I also attended two lectures the first by Anne Bromer, titled Miniature Books: 4,000 of tiny treasures, and the second presentation was titled Japanese Illustrated Books, by Charles Vilnis. During the first presentation I learned about the practical use of miniature books (usually books smaller than 3 inches). We saw a copy of a miniature book version of the Emancipation Proclamation which Lincoln had printed and gave to soldiers to hand out throughout many southern states. I also heard of a collection of classics that were printed in miniature form which people who spend a lot of time on the road could easily take with. In general I was surprised to learn that miniature books were usually created to be read and used, instead of being only for decoration. During the presentation on prints in Japanese books we saw an amazing selection of images that dated as far back as the 1600s and as recent as the mid 1900. The illustrations ranged from very simple, elegant images, to long scrolls that describes entire journeys.